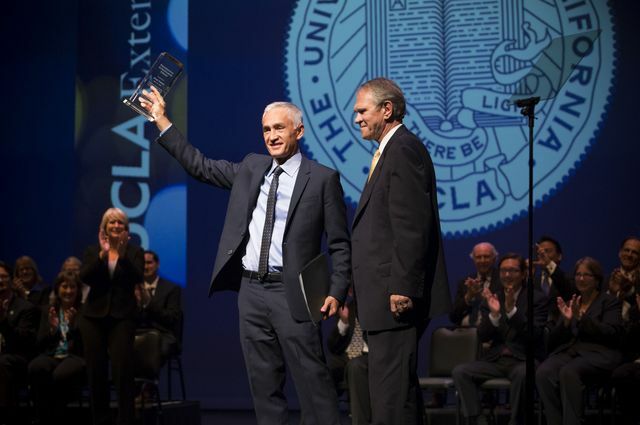 Longtime Univision news anchor Jorge Ramos is applauded after receiving UCLA Extension's Professional Achievement Award from Wayne Smutz, dean of UCLA Extension and Continuing Education. The TV journalist completed the Extension program in journalism in the 1980s. 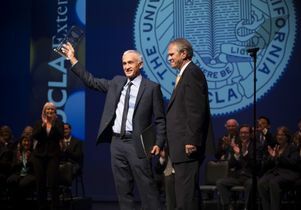 At a graduation ceremony before a sell-out crowd in Royce Hall, Jorge Ramos, news anchor for Univision for 29 years and one of Time magazine’s 100 most influential people for 2015, received an award and journalism certificate from Wayne Smutz, dean of UCLA Extension and Continuing Education, 31 years after the TV journalist completed the program. Ramos, the keynote speaker and special honoree, was applauded along with hundreds of other happy graduates at the event. He has worked as an anchor for Noticiero Univision since 1986. 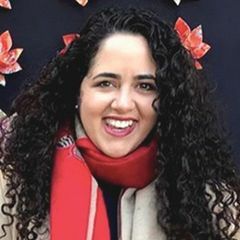 He currently hosts “America with Jorge Ramos” for the network Fusion — a joint venture between ABC News and Univision — and “Al Punto,” Univision’s weekly public affairs program. Ramos, who in the 1980s successfully completed Extension courses that included investigative journalism and TV news writing and production, told attendees that his studies at UCLA Extension helped him land his first broadcasting job at KMEX. Ramos also received Extension’s Professional Achievement Award. More than 2,000 people earned Extension certificates in 2014-15. 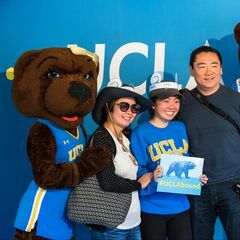 Previous Story UCLA's first lung transplant patient marks 25th anniversary of landmark surgery Next Story UCLA faculty voice: Minimum wage? How about a maximum wage?